Emily Webb, MD, is a Professor of Clinical Radiology in the Abdominal Imaging Section, and she is the Co-Director of the Goldberg Center for Advanced Imaging Education in the Department of Radiology and Biomedical Imaging at the University of California, San Francisco. She received her medical degree from New York Medical College in 2000, and completed her residency in Diagnostic Radiology at Yale New Haven Hospital, Yale University School of Medicine, followed by a fellowship in Abdominal Imaging at the University of California, San Francisco in 2006. Dr. Webb has a research interest in varied clinical applications of body CT and MRI, particularly in CT evaluation of the bowel and bowel pathology, which has been documented in her most recent publications and lecture topics. She also has an interest in oncologic imaging. Her primary research focus is on CT of the appendicitis. One project examined the utility of CT in adult men with suspected appendicitis, a topic that has been debatable in the existing surgical literature. Dr. Webb has significant publications related to her primary research interest. Topics include, cystic fibrosis, the equivocal appendix at CT, and acute appendicitis. 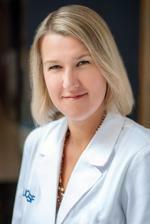 She has over 30 publications dedicated to her research, clinical trials, and study cases. Shah R, Khoram R, Lambert JW, Sun Y, Wang ZJ, Webb EM, Yeh BM. Effect of gantry rotation speed and scan mode on peristalsis motion artifact frequency and severity at abdominal CT. Abdom Radiol (NY). 2018 Sep; 43(9):2239-2245. Yen AJ, Webb EM, Jordan EJ, Kallianos K, Naeger DM. The Stability of Factors Influencing the Choice of Medical Specialty Among Medical Students and Postgraduate Radiology Trainees. J Am Coll Radiol. 2018 Jun; 15(6):886-891. Webb EM, Bucknor MD, Naeger DM. Diversity and Inclusion: Now Radiology Must Walk the Walk. J Am Coll Radiol. 2018 04; 15(4):687-688. Phelps A, Callen AL, Marcovici P, Naeger DM, Mongan J, Webb EM. Can Radiologists Learn From Airport Baggage Screening? : A Survey About Using Fictional Patients for Quality Assurance. Acad Radiol. 2018 Feb; 25(2):226-234. Kallianos KG, Webb EM, Conrad M, Ahearn B, Naeger DM. Interest in Interventional Radiology at Different Stages of Training: Possible Implications for the New Integrated Interventional Radiology Residency. Curr Probl Diagn Radiol. 2018 Sep; 47(5):293-295.
van der Gijp A, Webb EM, Naeger DM. How Radiologists Think: Understanding Fast and Slow Thought Processing and How It Can Improve Our Teaching. Acad Radiol. 2017 06; 24(6):768-771.
van der Gijp A, Vincken KL, Boscardin C, Webb EM, Ten Cate OTJ, Naeger DM. The Effect of Teaching Search Strategies on Perceptual Performance. Acad Radiol. 2017 06; 24(6):762-767.
van der Gijp A, Ravesloot CJ, Ten Cate OT, van Schaik JP, Webb EM, Naeger DM. Tests, Quizzes, and Self-Assessments: How to Construct a High-Quality Examination. AJR Am J Roentgenol. 2016 Aug; 207(2):339-43. Phelps A, Wan J, Straus C, Naeger DM, Webb EM. Incorporation of Ultrasound Education Into Medical School Curricula: Survey of Directors of Medical Student Education in Radiology. Acad Radiol. 2016 07; 23(7):830-5. Kozak B, Webb EM, Khan BK, Orozco NM, Straus CM, Naeger DM. Medical Student Usage of the American College of Radiology Appropriateness Criteria. Acad Radiol. 2015 Dec; 22(12):1606-11. Jen A, Webb EM, Ahearn B, Naeger DM. Lecture Evaluations by Medical Students: Concepts That Correlate With Scores. J Am Coll Radiol. 2016 Jan; 13(1):72-6. Webb EM, Ahearn B, Naeger DM. A Designated "Teaching Resident": A Novel Leadership Position to Promote Educational Skills and an Academic Career. J Am Coll Radiol. 2016 Jan; 13(1):77-80. Naeger DM, Hua EW, Ahearn B, Webb EM. Reflective Writing: A Potential Tool to Improve Interprofessional Teamwork with Radiologists. Acad Radiol. 2015 Oct; 22(10):1221-5. Webb EM, Phuong JS, Naeger DM. Does Educator Training or Experience Affect the Quality of Multiple-Choice Questions? Acad Radiol. 2015 Oct; 22(10):1317-22. Webb EM, Naeger DM, McNulty NJ, Straus CM. Needs Assessment for Standardized Medical Student Imaging Education: Review of the Literature and a Survey of Deans and Chairs. Acad Radiol. 2015 Oct; 22(10):1214-20. Naeger DM, Jen A, Ahearn B, Webb EM. Effectively Acquiring and Using Feedback. J Am Coll Radiol. 2015 Dec; 12(12 Pt A):1320-3. Webb EM, Vella M, Straus CM, Phelps A, Naeger DM. Interpretive versus noninterpretive content in top-selling radiology textbooks: what are we teaching medical students? Acad Radiol. 2015 Apr; 22(4):520-6. Benedetti NJ, Naeger DM, Webb EM. Radiology primer: A novel radiology course for undecided medical students. J Am Coll Radiol. 2014 Dec; 11(12 Pt A):1182-5. Valenzuela DM, Behr SC, Coakley FV, Wang ZJ, Webb EM, Yeh BM. Computed tomography of iatrogenic complications of upper gastrointestinal endoscopy, stenting, and intubation. Radiol Clin North Am. 2014 Sep; 52(5):1055-70. Webb EM, Cotton JB, Kane K, Straus CM, Topp KS, Naeger DM. Teaching point of care ultrasound skills in medical school: keeping radiology in the driver's seat. Acad Radiol. 2014 Jul; 21(7):893-901. Straus CM, Webb EM, Kondo KL, Phillips AW, Naeger DM, Carrico CW, Herring W, Neutze JA, Haines GR, Dodd GD. Medical student radiology education: summary and recommendations from a national survey of medical school and radiology department leadership. J Am Coll Radiol. 2014 Jun; 11(6):606-10. Chu LL, Webb EM, Stengel JW, Yeh BM, Lu Y, Coakley FV. CT of acute appendicitis: can diagnostic accuracy serve as a practical performance metric for readers specialized in abdominal imaging? Clin Imaging. 2014 Jan-Feb; 38(1):56-9. Naeger DM, Wilcox C, Phelps A, Ordovas KG, Webb EM. Residents teaching medical students: how do they compare with attending educators? J Am Coll Radiol. 2014 Jan; 11(1):63-7. Penn A, Wang W, Wang ZJ, Yee J, Webb EM, Yeh BM. Demographics and frequency of the intermittently upturned omentum at CT. Eur J Radiol. 2013 Nov; 82(11):e637-40. Naeger DM, Webb EM. Social media for professional purposes: introduction to the JACR "how to" video guide. J Am Coll Radiol. 2013 Oct; 10(10):736-7. Keedy AW, Breiman RS, Webb EM, Roberts JP, Coakley FV, Yeh BM. Determinants of second-order bile duct visualization at CT cholangiography in potential living liver donors. AJR Am J Roentgenol. 2013 May; 200(5):1028-33. Webb EM, Naeger DM, Fulton TB, Straus CM. Learning objectives in radiology education: why you need them and how to write them. Acad Radiol. 2013 Mar; 20(3):358-63. Kane AJ, Wang ZJ, Qayyum A, Yeh BM, Webb EM, Coakley FV. Frequency and etiology of unexplained bilateral hydronephrosis in patients with breast cancer: results of a longitudinal CT study. Clin Imaging. 2012 Jul-Aug; 36(4):263-6. Kumar R, Wang ZJ, Fu Y, Forsythe C, Webb EM, Yeh BM. Visualization of renal medullary hyperattenuation at unenhanced CT: what is the effect of furosemide administration? Radiology. 2010 May; 255(2):495-500. Badiee S, Franc BL, Webb EM, Chu B, Hawkins RA, Coakley F, Singer L. Role of IV iodinated contrast material in 18F-FDG PET/CT of liver metastases. AJR Am J Roentgenol. 2008 Nov; 191(5):1436-9. Breiman RS, Coakley FV, Webb EM, Ellingson JJ, Roberts JP, Kohr J, Lutz J, Knoess N, Yeh BM. CT cholangiography in potential liver donors: effect of premedication with intravenous morphine on biliary caliber and visualization. Radiology. 2008 Jun; 247(3):733-7. Bethke L, Webb E, Sellick G, Rudd M, Penegar S, Withey L, Qureshi M, Houlston R. Polymorphisms in the cytochrome P450 genes CYP1A2, CYP1B1, CYP3A4, CYP3A5, CYP11A1, CYP17A1, CYP19A1 and colorectal cancer risk. BMC Cancer. 2007 Jul 05; 7:123. Webb EM, Green GE, Scoutt LM. Adnexal mass with pelvic pain. Radiol Clin North Am. 2004 Mar; 42(2):329-48.